Cauliflower is such a versatile vegetable! 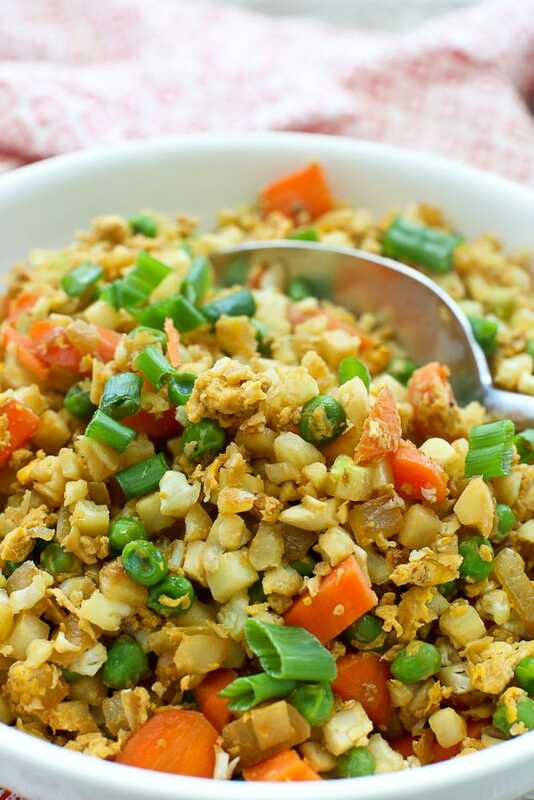 If you’re looking for a dish that is full of flavor, quick and easy, low carb and keto friendly, you will love this Cauliflower Fried Rice! If you love traditional fried rice, you’re going to LOVE this low carb and keto Cauliflower Fried Rice! Seriously, is there anything cauliflower can’t do? I mean really. This Instant Pot Mashed Cauliflower is one of the most amazing things to ever touch my lips. Simply Roasted Cauliflower? Perfection. Need a healthy appetizer? Buffalo Cauliflower Bites. Oh, you want soup? Cauliflower Soup with Coconut, Turmeric, and Lime. Ok, you get the idea. I’m a big fan of cauliflower and all its culinary prowess. I’ve had a lot of versions of cauliflower rice, and Cauliflower Fried Rice is my new favorite. It’s just so flavorful and super easy to prepare. It’s got all the things you love about fried rice, just without the actual rice. Nothing against rice, but I know many of you are interested in eating less carbs. This dish makes that easy! Making Cauliflower Fried Rice is incredibly easy. You can have this dish ready in less than 20 minutes! Here are my best tips to make it as easy as possible. Buy riced cauliflower. Most grocery stores sell it these days and it takes a step out of your prep work. I love a good shortcut! Lightly beat your egg and have it in a bowl, ready to go. Use a large skillet pan so all of your vegetables and riced cauliflower will fit without overflowing. If you don’t have a large pan, use two. As written, this recipe is a side dish. If you want it to be your main course, you can add a protein like chicken or shrimp. To make it with chicken, add small, bite sized pieces of chicken before you add the vegetables. Continue with the recipe as written. To make it with shrimp, simply cook the shrimp first, set it aside, and then add it back to the final dish at the end. I hope you enjoy this recipe for Cauliflower Fried Rice as much as I have! 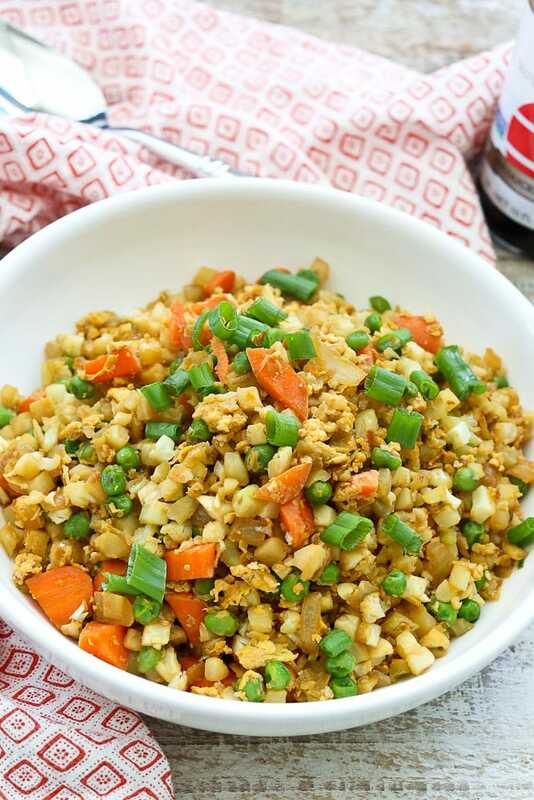 This Cauliflower Fried Rice is super easy to prepare, full of flavor, and is a low carb, keto friendly dish! Heat the sesame oil in a large skillet over medium heat. Add the onion, carrots, and peas and sauté for 4 minutes. Add the eggs and use a spatula to continuously move the eggs until they are cooked. Add the riced cauliflower and continue to cook until the cauliflower pieces are soft and cooked, about 5-7 minutes more. Drizzle the tamari on top and stir to evenly incorporate. Taste and add salt and pepper as necessary. I prefer to buy riced cauliflower. You can make your own riced cauliflower by coarsely chopping a head of cauliflower OR using your food processor to process into small pieces. Do not over process or you will have mushy “rice.” The prep time listed assumes you took the same shortcut I like and bought your cauliflower already riced. Make this a main dish entrée by turning it into Cauliflower Fried Rice with Chicken or Cauliflower Fried Rice with Shrimp. To make it with chicken, add small, bite sized pieces of chicken before you add the vegetables. Continue with the recipe as written. To make it with shrimp, simply cook the shrimp first, set it aside, and then add it back to the final dish at the end. 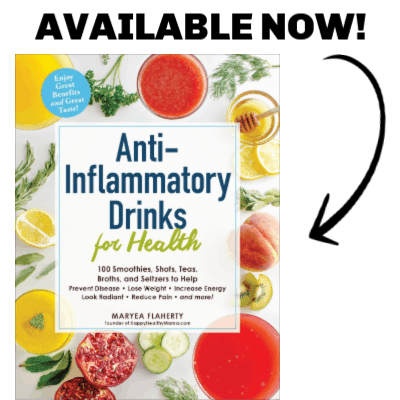 Links to products are affiliate links. There’s no way I would’ve thought of using cauliflower in a recipe like this! This looks so good and filled with flavor. I need to try this soon! Thank you for sharing the recipe. I love cauliflower fried – it makes the smell and the taste a lot better!